press and hold button 1 for about five seconds until a tone sounds. : press and hold button 2 for about five seconds until a tone sounds. If you press one of the two buttons and do not hear a tone, the relevant setting has already been selected. The vehicle is locked automatically when the ignition is switched on and the vehicle's wheels are moving at a speed in excess of 9 mph (15 km/h). You could therefore be locked out if: • the vehicle is being pushed. • the vehicle is being towed. • the vehicle is being tested on a dynamometer. 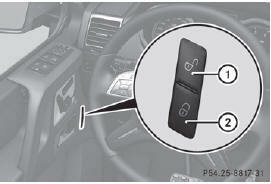 You can also switch the automatic locking function on and off using the on-board computer .